He Holds My Right Hand: HYMN: I Gave My Life for Thee / What Have You Given Back? 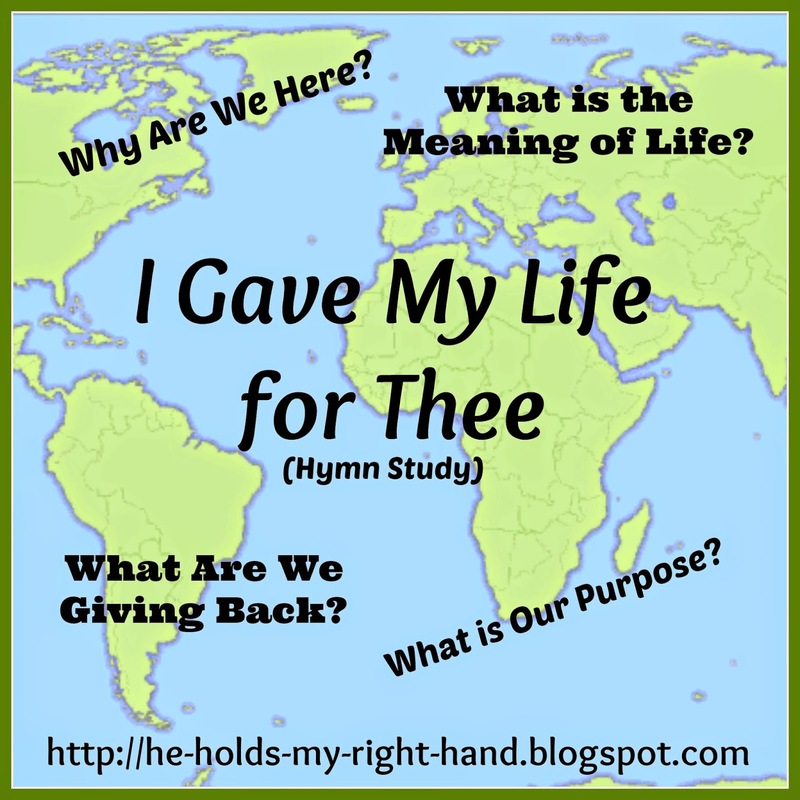 HYMN: I Gave My Life for Thee / What Have You Given Back? Last Sunday, my husband preached at our church to fill in while the Pastor was out of town. He spoke about the question, "Why are we here?" In other words, what is the meaning of life? Is it meaningless? These are just a few of the verses that actually tell us what our purpose is here on this earth. It really can't get any clearer. We are here for God's purposes. We aren't here to just have fun, live for ourselves, then die and no longer exist. We are meant to worship our Lord, serve Him with gladness, and glorify Him in all things. THAT is the meaning of life! So, no... if you believe in what the Bible says, life is not meaningless. In that case, here's another question: What are you DOING for God? How are you living your life? What have you given back to Him for all the gifts He has brought to you? Think about the ultimate gift He gave... Our Heavenly Father not only created us, His unfading love also sent Jesus to DIE for us. Why? Because, when sin entered the world, we were separated from God, and He hated that! So, He sent Jesus to provide a way for reconciliation to take place. That means, because of the ultimate gift of Jesus, we can now have a relationship with God. (For more information about this, click over to one of my informational pages about WHY WE NEED SALVATION. My husband gave a more detailed explanation of it there.) Have you placed your faith in Jesus and what He did for you on the cross? If not, don't put it off any longer. God gave the ultimate gift for YOU, and He's waiting for you to accept it. The hymn we sang at the end of the message on Sunday gave a good summary of all of this. It was written in 1858 by Frances Havergal, an English poet and hymn writer. I like this hymn because it reminds me to ask the question, "If God gave the ultimate gift to me, what am I giving back to Him?" This was a nice read and a timely reminder that we all have a purpose even the disabled and that is to worship our Creator. Also a reminder of what we need to be doing and concentrating on. Then everything else will fall into place! Thanks for sharing this on a Sunday morning. Thanks for your kind words, Sylvia. Have a blessed Sunday.